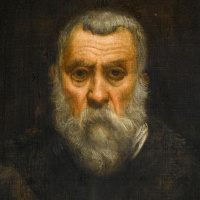 Artist Jacopo Robusti (better known as Tintoretto, 1518/1519 - 1594) is a master of the late Renaissance Venetian school. Born in Venice. His nickname (Tintoretto - "little dyer") received because of the profession of his father - dyer. Early showed talent for painting, entered the training to Titian and soon began to make progress. According to the legend, it was precisely this that frightened the teacher, who was predicting in his youth a dangerous rival - Titian refused to give him further training. • “Bacchus, Venus and Ariadne” and others. Pictures of the artist sharply showed the coming tragedy of the era, the proximity of change. "Talking" were many of the names of the works of Robusti. He used complex techniques for constructing compositions, angles, and perspectives. The works of Jacopo Robusti are characterized by rapid mobility. The master sought to describe and fix what arises, moves and then disappears, without lingering long before his eyes. He also willingly painted portraits, striking an excellent production of figures, the power of colors and expressiveness. The names of the paintings of the artist and their images are presented for review on the pages of Arthive.